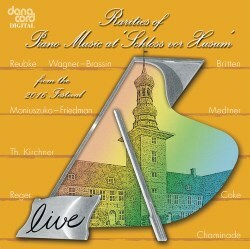 Husum Festival never fails to offer stimulating pianistic excitement; the rare, the odd, and the enticing. As is now standard practice, small pieces have been extracted from the executants’ recitals to form a programme of prismic delight. One of the pieces Johann Blanchard brought was Chaminade’s Les Sylvains, Op.60. She is very much back in vogue these days, and Blanchard plays with sensitive ardour. Chaminade herself recorded this for G & T back in 1901 and you can find it on APR. Fauré’s Barcarolle, No.8 was composed eight years later and continues the French theme in this performance by Severin von Eckardstein, a concept cemented by hearing Robert Casadesus’ Prélude Op.5 No.2. Casadesus was, of course, a great exponent of Fauré which makes the conjunction that much more interesting, even though his aesthetic here is more pensive and Ravelian. Eckardstein’s programme ranges vividly, taking in the Scriabin-influenced Anatoly Alexandrov’s Vision, Op.21 No.2 as well as the febrile drama and lingering lyricism of the tragically short-lived Julius Reubke’s Scherzo in D minor. He then ends with a blazing Magic Fire Music from the Valkyrie in the arrangement by Louis Brassin. Hot as mustard, this. Liszt and Medtner occupy Zlata Chochieva, the poetry of the former’s Hymne de la nuit being picked up by the latter’s beautiful Canzona serenata, Op.38 No.6. Indestructible Martin Jones contributes two Earl Wild Rachmaninoff transcriptions and manages to play them, if anything, with an even greater sense of directional ardency than the transcriber himself – very impressive and not just in matters of speed. Alongside the Paderewski Nocturne, Op.16 Hubert Rutkowski plays the Moniuszko-Friedman Printemps, Op.28 No.1 with fluency, whereas we hear two of the Schumannesque Nachtbild by Theodor Kirchner in the offering by Florian Noack. Joseph Moog has become well-known of late and presents a contrasting brace of Reger and Scarlatti-Tausig, which leads to two duo teams: the Duo Grau/Schumacher play the Mozart-Busoni Overture to the Magic Flute with infectious brio whilst the Duo Mercier/Katsaris plunge into the Brahms Hungarian Dance, piano four hands. In this context it’s a witty programming conceit to move straight into two pieces from Britten’s Holiday Diary, courtesy of Artem Yasynskyy. To finish there is Simon Callaghan establishing a small British envoi thanks to Roger Sacheverell Coke’s Prelude, Op.33 No.7 - in the main programme of his concert he played the 15 Variations and Finale. There’s just time for Callaghan to conclude the disc with Steven Hough’s witty take on Rodgers and Hammerstein’s My Favorite Things. As is also customary Peter Grove’s notes are witty and pithy and tell you all you need to know and more besides. Another sure-fire winner from Husum.